The Scarborough Fly and Bait Casting Association (SFBCA) was created over 30 years ago by casting legend, author and Scarborough Walk of Fame Member – Gord Deval. Known to his fishing buddies as “the Old Guy”, Gord continues to help SFBCA members in becoming proficient in all the angling arts. Whether you are a novice fisherman or a seasoned fly fishing veteran, Gord and the SFBCA can help you take your angling to the next level, all for just a $50 annual membership fee. From Spring to early Fall we meet once a month at a local pond to practice fly casting and spin casting techniques. We set up targets and members practice their casting accuracy. Veteran members are on hand to give demonstrations and to provide one on one casting help. SFBCA members have decades of fly tying experience and know the fly patterns that actually catch fish in our part of Ontario. We meet every other Tuesday evening at Birkdale Community Centre (1299 Ellesmere Rd., Toronto). Our Fly Tying Master discusses and demonstrates the fly patterns we’ll be tying for the evening. We then all go through the tying process step by step. Our expert fly tiers are on hand to help those with limited experience. We have lots of spare tying vices and materials to get you started and we can advise you on what materials and equipment to buy if you want to tie at home. One of the activities that sets our club apart from others is our interest in handcrafting, split-cane bamboo rods. Almost every member of the SFBCA has built one or more of these unique rods, using designs developed by our President, Gord Deval. The SFBCA has all the specialized tools and expertise needed to make and repair bamboo rods. 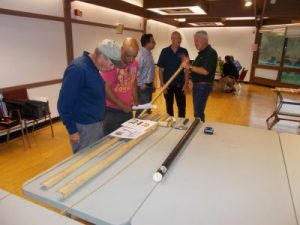 You don’t have to be an expert woodworker to build a rod either…with a little patience and some help from fellow SFBCA members, you too can be the proud owner of bamboo fly rod. Over the course of the fishing season, the SFBCA organizes club trips, BBQs and participates annually in the Toronto Sportsmens Show. Individual SFBCA members routinely set up their own one day fishing trips to explore local lakes and streams (there’s never a shortage of SFBCA members looking to meet up and go fishing). Thanks for the kind remarks Peter. Hope you enjoyed the Show. A healthy shout out to Gord’s group of casters still going strong after all these years. Best wishes to all of you. Glad to find a fishing club in Scarborough. I have been looking for a fishing club or group. I’ll keep in touch and follow the news now on. Roger Cannon told me about your club and it organizes a number of activities that sound interesting to me. In the past I have enjoyed fly fishing and fly tying. These days I am more of a collector of old reels and tackle including split-cane rods. Please put me on your mailing list and I will try to get involved when meetings start later in the year. Scarborough Fly and Bait Casting Assoc. Thanks, Geoff. I look forward to it!